Ai Weiwei was not exactly a part of the 1989 student movement. At that time, he was a young, aspiring artist living a free life in New York City, supporting himself by drawing portraits on sidewalks, performing various manual labors, taking pictures for news magazines, and playing blackjack at Atlantic City. But in May that year, he did fast for a few days on his own to show solidarity with the hunger striking students in Beijing. A few years later, he moved back to Beijing. 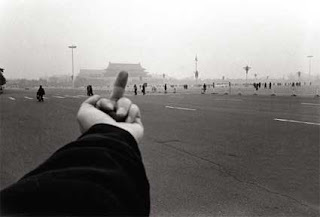 At the fifth anniversary of the Tiananmen Massacre, he shot a famous picture showing his future wife exposing her underwear at that holy place. 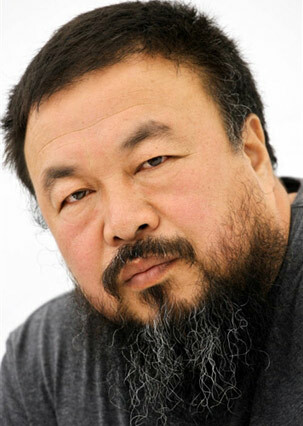 Ai Weiwei became an art student in the prestigious Central Film Academy in 1978. He promptly got involved in the "Stars," an early avant garde artist group which played a fringe role in the Democracy Wall movement. His career really took off in China at the turn of the century, gaining international fame with various exhibits abroad. At home, he was part of the team that created the famous Bird Nest Olympic Stadium and was successful in painting, photographing, sculpture, architecture, and later as a blogger. It was his blogging endeavor that gradually led him into troubled waters. He applied his avant garde style to social issues and was deeply involved in several hot topics as he sought to speak for victims of earthquake, poisoned milk, and government harassment. Even his artwork became more and more about symbolic protests to repression. Although he had been careful in staying within a carefully observed boundary, he found himself badly beaten once and his studio in Shanghai demolished. Last Year, New Yorker profiled his life, titled "It's Not Beautiful." He might finally have pushed the envelop too far. This week, Ai Weiwei was arrested in Shanghai. After days of silence and rumors, the government appears to be investigating him for "economic crimes." UPDATE: After three months of detention, Ai Weiwei was released on June 22, 2011, under conditions similar to on bail. Please correct your statement: Ai was arrested at Beijing Airport on April 3rd, 2011 when he was going to board a flight to Hong Kong.